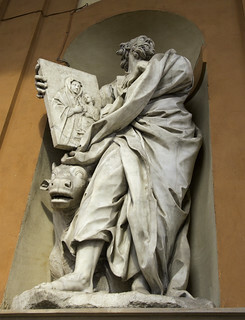 This statue of St Luke is in the Sanctuary of St Luke in Bologna. The Evangelist is shown with his attribute, an ox, because his Gospel opens in the Temple with the high priest offering sacrifice. And he is shown holding an icon of Our Lady and the Child Jesus because he is believed to have painted an icon of them; he is the patron saint of artists. Today, 18 October, is the feast of St Luke the Evangelist. My sermon for today can be read here.